The Digital Research Library of Illinois History Journal™: The Impact of World War I on the German Residence of Illinois. The Impact of World War I on the German Residence of Illinois. 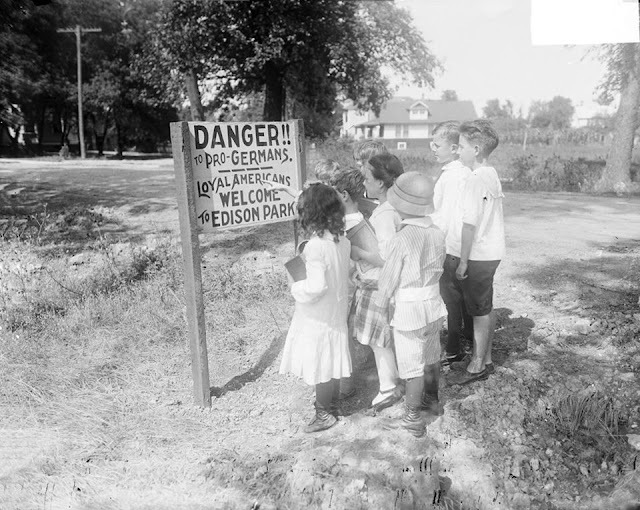 Children standing in front of an anti-German sign posted in the Edison Park neighborhood, 1917. The war inflamed and altered Chicago’s ethnic landscape. The city’s large German and Irish communities tended to sympathize with the Central powers: Germany, Austria-Hungary, Turkey, and Bulgaria, or at least favored American neutrality. Chicago’s Germans, the city’s largest immigrant group, vociferously opposed Washington’s growing sympathy for the Entente powers: Great Britain, France, and Russia. Prominent Chicago German Americans, such as meat-packer Oscar Mayer, city plan commission member Charles Wacker, and Chicago Symphony Orchestra director Frederick Stock, as well as the Germanophile Irish American congressman Fred Britten, were well placed, and vocal, opponents of an American alliance with the Entente. German Americans, however, failed to keep the United States neutral. German attacks on American shipping and revelations of a German initiative to secure a Mexican alliance in return for a promise of returned territory in the Southwest silenced many opponents to war with Germany. Once the United States entered the war, German Americans, as well as their culture, fell under growing suspicion. German-sounding foods were renamed: sauerkraut became “liberty cabbage,” and frankfurters became “hot dogs.” Chicago institutions were anglicized as well, with the Germania Club becoming the Lincoln Club, and the Bismarck Hotel the Hotel Randolph. Frederick Stock took a brief leave of absence from the Chicago Symphony Orchestra to apply for naturalization. Zealous to ensure domestic security, private organizations such as the American Protective League monitored Chicago’s Germans and detained draft dodgers in occasional “slacker” drives. WWI’s most significant long-term impact on Chicago involved economic adjustments, especially in the labor force. The war shut off immigration and siphoned native-born labor into the war effort. Many Chicago employers turned to women and African Americans, hiring them for jobs previously reserved for white men. These new opportunities, mainly in heavy industry, stimulated the Great Migration of African Americans from the South to Chicago and other northern cities. Some German Americans reacted by overtly defending their loyalty to the United States. Others changed the names of their businesses, and sometimes even their own names, in an attempt to conceal German ties and to disappear into mainstream America. Ironically, and contrary to Wilson's opinion about divided loyalties, thousands of German Americans fought to defend America in World War I, led by German American John J. Pershing, whose family had long before changed their name from Pfoerschin. Billboard sign at the Great Lakes Naval Training Station in North Chicago that reads: "Damn the Torpedoes - Go Ahead!" 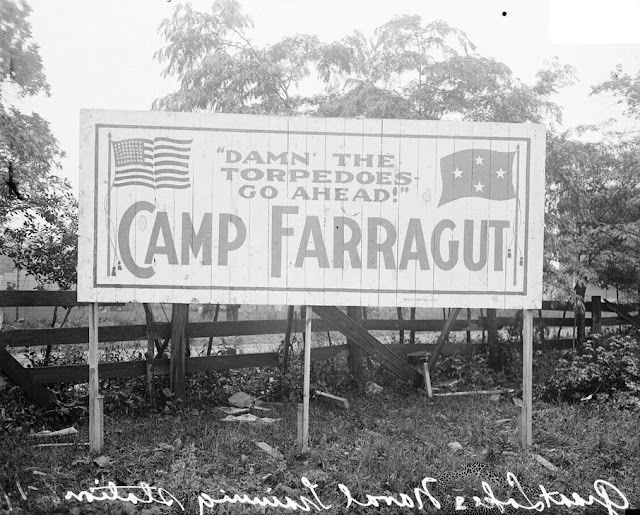 Camp Farragut, 1917. The sign features an American flag and a flag with four stars. Anti-German sentiment, was prevalent across the Midwest, places where Germans had come in great numbers starting in the middle of the 19th century. Similar stories may be found concerning St. Louis, Milwaukee, Cincinnati, and elsewhere. In southwestern Illinois, a particularly popular place for immigrants from German-speaking Europe, the culture created by these immigrants faded fast with the onset of WWI. One example, in Belleville (St. Clair County), all three German language newspapers folded within months of the outbreak of war in 1914. The public schools stopped teaching German. Plenty of names changed: Brauns became Brown, Muellers became Miller, and so on. One thing, however, that didn't change was the Belleville Turnerverein. Renamed the Belleville Turners, this organization continued its cultural and athletic activities into the 1950s. Fifteen years later, the shadows of a new war brought another surge in immigration. When Germany's Nazi party came to power in 1933, it triggered a significant exodus of artists, scholars and scientists, as Germans and other Europeans fled the coming storm. Most eminent among this group was a pacifist Jewish scientist named Albert Einstein. Anti-German feelings arose again during World War II, but they were not as powerful as they had been during the first World War. The loyalty of German Americans was not questioned as virulently. Dwight Eisenhower, a descendant of the Pennsylvania Dutch and future president of the United States, commanded U.S. troops in Europe. Two other German Americans, Admiral Chester Nimitz of the United States Navy and General Carl Spaatz of the Army Air Corps, were by Eisenhower's side and played key roles in the struggle against Nazi Germany. World War II, industrial expansion, and Americanization efforts reinforced the cultural assimilation of many German Americans. After the war, one more surge of German immigrants arrived in the United States, as survivors of the conflict sought to escape its grim aftermath. These new arrivals were extremely diverse in their political viewpoints, their financial status, and their religious beliefs, and settled throughout the U.S.
German immigration to the United States continues to this day, though at a slower pace than in the past, carrying on a tradition of cultural enrichment over 400 years old—a tradition that has helped shape much of what we today consider to be quintessentially American. Great article. My Great Grandfather & family left the Germanic region in the late 19th century. They passed through NY (too dirty) and Cleveland (few countymen). They finally settled down on the north side of Chicago.